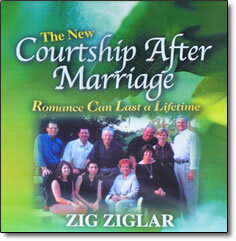 Courtship After Marriage – CDs by Zig Ziglar – Discount! Zig Ziglar recognizes the importance of building a relationship that can stand the test of time and the pressures from society to become a strong, firm foundation for the entire family. In Courtship After Marriage, Zig teaches couples how a warm, loving, respectful commitment can stay and even grow stronger throughout the years. In our hurried and self-centered culture, the real work required to keep love alive is often ignored. We live in an era where “We just don’t love each other anymore” is considered grounds for divorce, and frequently the consequences of ending a marriage are minimized. We’ve all heard the overwhelming statistics. Zig and his beautiful wife Jean (“the redhead” as he affectionately calls her) have been married for more than 50 years. In this audio book, Zig shares his personal experience, the ups and downs that he has encountered in his own marriage, and how these experiences have strengthened his marriage beyond what even he dreamed possible. Zig’s practical advice offers a positive alternative to the grass-is-greener thinking that permeates our culture today and that forces couples to give up when there is actually still much hope for their relationship. Zig teaches couples how to focus on their own marriage and invest themselves in simple, effective strategies that can make their marriage everything it was meant to be. Strategies that have stood the test of time and the stresses and pressures we all face day-to-day. The romance never has to fade. You don’t have to settle for a mediocre marriage or figure that things will never change. Above all, you don’t need to look elsewhere for happiness and fulfillment. You can make your marriage the one you always dreamed of. Whether you’ve been married one year, five years, or 50 years, like Zig and Jean, Courtship After Marriage will show you that you can have it all. With a little work and a lot of love, you will discover or rediscover your best friend–your spouse. You’ll find that you can have love that will last a lifetime.